No reaction is observed against other related tumor supressor proteins. Synthetic peptide (Human) conjugated to KLH. Our Abpromise guarantee covers the use of ab6545 in the following tested applications. WB 1/200 - 1/1000. Predicted molecular weight: 128 kDa. 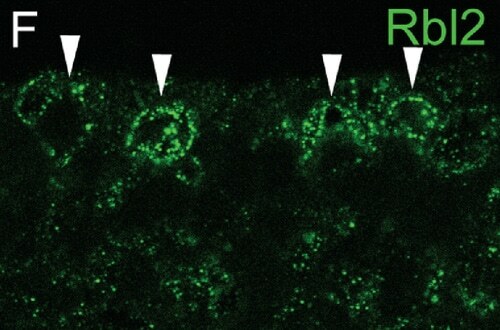 Two retinoblastoma related proteins, p107 and pRb2 / p130, which are structurally and functionally similar to the product of the retinoblastoma gene (pRb / p105), were cloned by taking advantage of their ability to bind transforming proteins of DNA tumor viruses through a particular region called the "pocket domain." Like pRb, both proteins play a fundamental role in growth control. These Rb family proteins were measured in a variety of lung neoplasms. The highest percentage of undetectable levels and the tightest inverse correlation with the histological grading and with PCNA expression in the most aggressive tumor types were found for pRb2 / p130, which may suggest an important role for this protein in the pathogenesis and progression of lung cancer. ab6545 staining Rb2 p130 in Mouse lung tissue sections by Immunohistochemistry (IHC-P - paraformaldehyde-fixed, paraffin-embedded sections). Tissue was fixed with 4% paraformaldehyde in PBS at 4°C overnight, embedded in paraffin was and section a 7μm. Endogenous enzyme activity was quenched by 2% H2O2 in methanol (30 minutes). Sections were blocked wirh 2% BSA, 5% serum and 0.1% Trition X-100 in PBS. Samples were incubated with primary antibody (1/500 in blocking buffer). White arrow heads mark epithelial cells expressing high levels of protein in nuclear and perinuclear locations. The staining shows the location of pRb2 / p130 in developing mouse tissue. Publishing research using ab6545? Please let us know so that we can cite the reference in this datasheet. The customer called to inquire as to whether our anti-RB products would also recognize RB2 and RB3 in rat on western blot. Thank you for contacting Abcam and for your help in finding the associated proteins on the phone. I have had the chance to run the alignments of these proteins and have found that the homology between them is extremely poor. As such I do not believe that you will be able to find a single product which recognizes all targets. I have compiled a short list of products which re against each protein and are suitable for western blot on rat tissues for you. Hi, I would like to know the specific sequence that this antibody is directed against. Thanks. Thank you for your enquiry. I have enquired at the originator of the product but unfortunately, the immunogen sequence　is not available, but this polyclonal antiserum recognizes epitopes in the　C-terminus region of Rb2(p130). I hope this information will still be helpful. I would like to know the sequence that this antibody is targeted to. Thank You. I am looking for full length (or shorter but covering some putative phospho-acceptor sites) recombinant p130/Rb2 pocket protein tumor suppressor. I want to study the post-translational modifications of that protein e.g.after labeling it in vitro. I were very happy if you would know where we could purchase it and what the cost would be. Thank you for your attention in this matter. Is the product ab6545-100 (p130 antibody) available in a sample size pack? Cheers. We do not offer small samples for testing purposes, but rather our policy is that if a product does not work as specified on the datasheet we offer a replacement or refund.